The word, “mollusk” means soft, and mollusks are just that. They don’t have skeletons or exoskeletons. Some have shells made of calcium. Can you guess which animals might be mollusks? If you guessed slugs and snails, you’re right. Clams, mussels, octopus and squids are also mollusks. Think about it. None of these animals have bones. None of them have outer skeletons like beetles. They’re all soft. Squids are mollusks. Squids can grow up to 55 feet long. Mollusks probably started in the sea and most of them still live there. A few, such as snails and slugs, live on the land. But snails and slugs need moist soil to survive. They like to live in cool, shady gardens, where they snack on hostas and other plants. 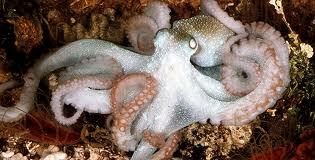 Octopuses can change their coloring to blend in with their surroundings. Octopuses have amazing defenses. They can change their coloring to blend in with their surroundings. They can squirt out ink to distract a predator. They can even lose an arm if a predator grabs them. Finally, octopuses can give a nasty bite with their beaks if necessary. Don’t mess with an octopus! 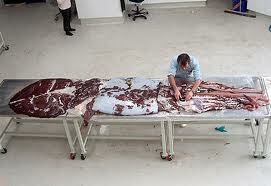 Most squids are small, but the giant squid is huge. It can grow up to 55 feet long. Most are about 33 feet long. Their eyes are the size of beach balls, which lets them see in the dark ocean. 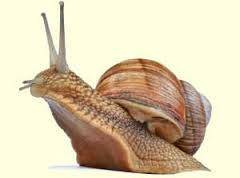 Snails and slugs are called gastropods. There are over 80,000 species of gastropods in the world. Some people love to eat snails. Clams and mussels live in the sea and rivers. 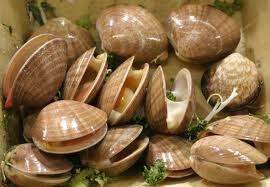 Clams live in the sea and rivers. A news video about the giant squid. Question: Are all mollusks edible? Answer: Most mollusks are edible. For example, the calamari dish is made from small squid. some eat steamed squid stuffed with rice and vegetables. Octopus is another seafood people love eating in Asia and elsewhere. French people love eating snails while Australian Aboriginals eat other slugs. Enjoyed the Easy Science for Kids Website all about Mollusks info? Take the FREE & fun all about Mollusks quiz and download FREE Mollusks worksheet for kids. For lengthy info click here. Declan, Tobin. " Fun Mollusks Facts for Kids ." Easy Science for Kids, Apr 2019. Web. 24 Apr 2019. < https://easyscienceforkids.com/all-about-mollusks/ >.